Spain 2018 - back to the Pyrenees - Pamplona again for 2 nights and a great ride out into the Pyrenees. 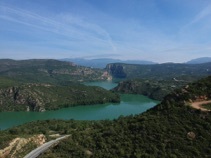 Then, 200 miles across to Sort for 3 night stay and some superb riding on marvellous roads in the foothills and the mountains of the Pyrenees. Then off to an old monastery for a night before heading North for a curry night out in Vitoria.